Step One: Start with a great foundation. You spend 1/3 of your life in bed. Make that time count! Invest in a mattress cover and pad to protect your bed and make it that much more comfortable. Layer your fitted sheet on top of those and your foundation has been laid. Step Two: To flat sheet or not to flat sheet? Some say a bed would be incomplete without it. Others claim it’s basically extraneous fabric. Thus, the great debate ensues. While there are no hard and fast rules, Americans, unlike our European counterparts, largely embrace the flat sheet. If you fall into this camp, make sure to lay the finished side of the sheet face down atop the fitted sheet, so when the bed is made, you can fold the top of the sheet back over the cover, exposing the hemmed or patterned side. Time to up the cozy-factor. Layer and tuck a thin blanket or quilt over your flat sheet. In warmer months, this will likely be all that’s needed to get you through the night. Add your duvet cover and fold back into thirds at the foot of the bed. Viola! It’s out of the way, tidy, and within arm’s reach when you need it. Step Four: The Layer's the Thing. A coverlet is a bedcovering with sides that hang down a few inches past the box spring but don’t touch the floor. A coverlet can be tucked in or left untucked if edged with decorative trim. They can be layered directly over a flat sheet or over a blanket. Truly the perfect finishing touch! Step Five: Prop it up… Pillows! A beautiful arrangement of pillows is the ultimate finishing touch on a well-made bed. While there is no precise formula for this very personal endeavor, our friends at Matouk were happy to share a few guidelines to ensure that your bed looks smart and that you feel fantastic coming home to it. Pro Tip: If you have a lot of pillows, place an empty basket nearby to place pillows in at night. You can also roll up an extra blanket in the basket so it is easy to grab on chilly nights. 2. Layer a pair of luxury decorative pillows in front of a sleeping stack. Use a pattern that incorporates a color from your bedding to tie together the look. 3. Or, prop up pillows fitted with standard size shams in front of your sleeping stacks. This is best done with pillows that have some heft, as light and airy feather pillows have a tendency to be floppy, and thus sloppy. 4. Add a single decorative pillow, preferably 20-inches-by-20-inches in size, centered in front of the propped-up shams. 5. Another option: Prop your sleeping pillows up against the headboard, then layer pillows outfitted in shams in front. Finish with a centered pillow encased in a boudoir sham, which fits a smaller 12-inch-by-16-inch rectangular pillow. 6. 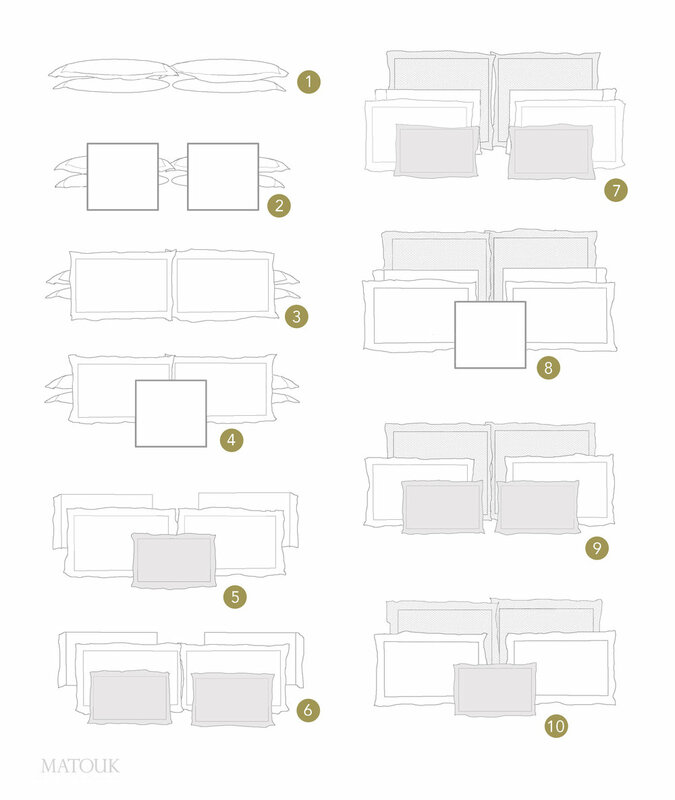 Start out with the formation above, but finish with a pair of boudoir pillows centered in front of each pillow sham. 7. Start with a pair of plump European squares for this pillow formation. Use inserts that are one-inch larger than the European sham to yield a full and rounded pillow. (This is especially good for filling out a bed without headboard, or for styling a bed with a particularly tall, oversize headboard.) Next, add your sleeping pillows. 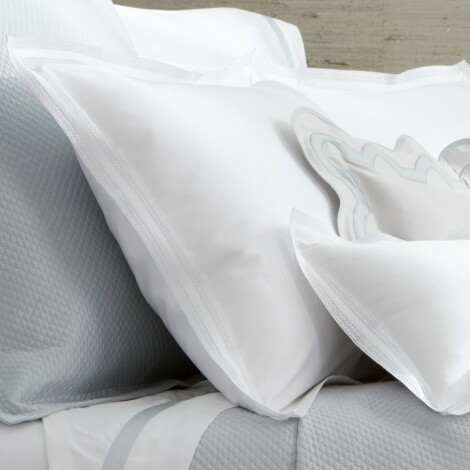 Directly in front, layer standard pillows encased in standard shams. Finally, add a fourth layer of smaller size pillows in boudoir shams. Note that all the rectangular pillows align with each other, just a bit offset from the edge of the European squares, so they peek through. 8. Try this pillow formation, which varies from the one above only in that the fourth and final layer is a centered decorative pillow. Don’t be afraid to go bold with pattern here. Or, for a more subdued style, use a decorative pillow with a tone-on-tone texture. 9. Go with a pair of European squares for a more streamlined look, or a pair of standard shams pulled slightly to the outer edges of the bed, and a third layer of boudoir pillows pulled slightly to the center. It’s clean, but with a bit of tension to make things interesting. 10. Finally, do the same as above for the first and second layers, but center a single boudoir pillow on the standard shams. Note, if you use pillows with standard pillowcases on your bed, you’ll have to remove them to pull off this look as well as the one above. Want to see more? Check out our Exclusive Matouk Pinterest board! 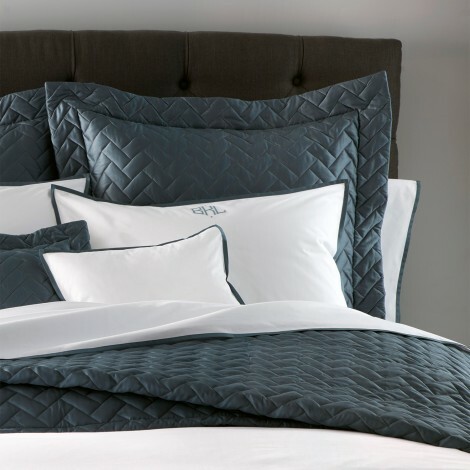 Ultra-luxurious Egyptian cotton bedding woven in Italy is replete with the luminous sheen of sateen and an eye-catching revival of a traditional herringbone pattern. Contact us for details! The newest addition to the Matouk fabric lineup. Talita is a new sateen for percale lovers. Crafted from rare Egyptian Cotton Giza yarn and finished with a one-inch flange and satin stitch, Talita is lightweight, breathable, and the epitome of sublime simplicity. Contact us for details! With fine detail and regal presence, Lulu DK’s new hand-drawn medallion print is cast on Matouk cotton Luca percale and made to coordinate with Joplin. A simple satin stitch adds a clean classic finish. Contact us for details! Luminous sateen made of Egyptian cotton woven in Italy is available in an array of opulent colors and finished with self-colored 1-inch border for a collection that exudes unrivaled charm. Contact us for details! The elegant geometry of Moroccan tiles served as the inspiration for Matouk’s latest couture style. Aziza – a name that translates to “beloved” – features an intricate zig-zag appliqué cut from Matouk’s Nocturne sateen and sewn onto their exceptional Milano sheeting, a 600 thread count Egyptian cotton percale. Shown here embroidered in custom colors, Pool and Deep Jade. Aziza makes a grand and sophisticated statement. Contact us for details! Grace marries a delicate hand with timeless design. Swiss lace surrounds Talita, Matouk’s newest long-staple Giza Egyptian cotton sateen. The final look is a delicate, soon-to-be heirloom. Contact us for details!